Oddmakers are spotting the Bills more than two touchdowns in Minnesota this Sunday. On its face, Sunday’s game between the Minnesota Vikings and Buffalo Bills doesn’t seem like a matchup of particular historical significance. Though they do remain one of the NFC’s top contenders, the 1-0-1 Vikes are coming off a tie with the Green Bay Packers — apparently ties are a weekly thing now — while the 0-2 Bills are reeling after a second straight embarrassing defeat. For most of the country, it’s just another routine game to indifferently monitor via RedZone. To the Las Vegas oddsmakers, however, this Minnesota-Buffalo tilt is far from ordinary. The opening line on the game, which hasn’t moved yet, was 16½ points, making it one of the most lopsided point spreads in modern history. Since the 1970 AFL merger, only 62 games — including Bills-Vikings — have seen a spread of at least 16½ points according to Pro-Football-Reference.com. And it’s especially rare for it so happen this early in the year: Only eight of those games have come in Week 3 of the season or earlier. But apparently the bookmakers have seen all they need out of the Vikings and (especially) the Bills, who’ve gone from the wild card to the waste bin in record time. As a general rule, oddsmakers tend to wait until around Week 5 to really start setting these huge lines. It makes sense: Five weeks is a pretty fair point in the season to begin trusting a team’s results to tell us what they truly are. 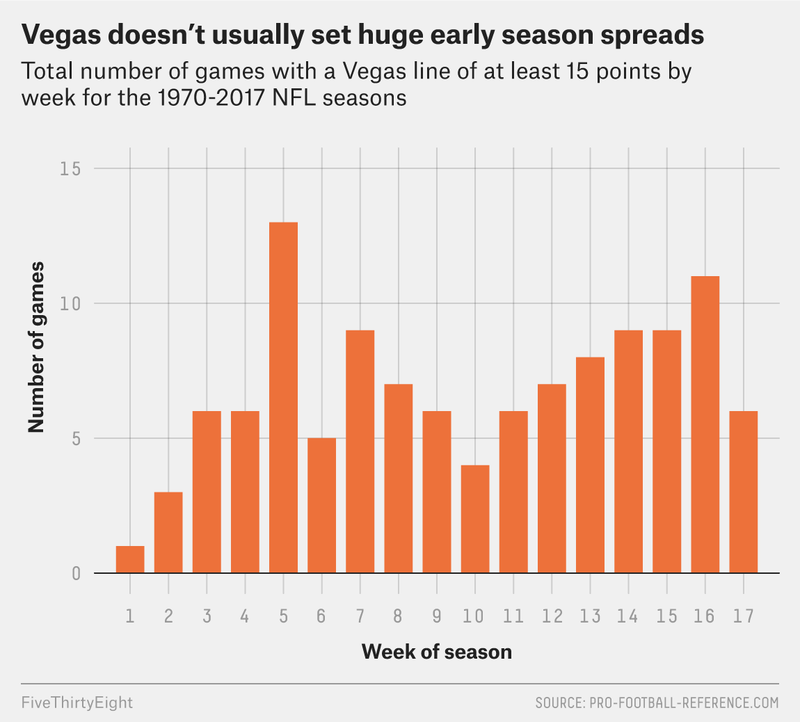 Before that, though, it’s difficult to filter out which performances are real and which are just early season flukes.1 That’s why, on average, the NFL sees a game with a 15-point spread in the first three weeks of the season only once every five or so years. And do these big early season favorites end up covering the spread? It’s notoriously difficult for massive NFL favorites to cover in general; of the 20 largest spreads in P-F-R’s database, only four saw the favorite actually cover once the dust settled.2 Overall, since 1970, only 44 percent of teams favored by at least 15 points ended up covering. To their credit, though, teams favored by at least 15 in the first three weeks of the season covered at a 60 percent clip. But don’t get too excited about that trend. In addition to keeping selection bias in mind — only the most overwhelmingly lopsided matchups tend to even earn a 15-point line this early — it’s worth noting that huge Week 4 favorites covered only once in six tries, pulling their overall cover rate through four weeks basically even with the average for the whole season. As for what’s driving such a massive line in this particular game, it mainly says a lot about the current state of the Bills. The Vikings are a good team, but not historically so — they currently rank fourth in the league according to Inpredictable.com’s betting market rankings, behind the Rams, Patriots and Jaguars. But at the other end of the spectrum, Buffalo might be historically bad. After losing by 44 points in Week 1, they found themselves trailing 28-3 in Week 2 before putting together some garbage-time scores to make things slightly more respectable. That didn’t fool anybody: Even after Buffalo replaced interception machine Nathan Peterman with rookie Josh Allen, Inpredictable’s ratings say the Bills would still be 10-point underdogs against an average team on a neutral field. For comparison’s sake, even the Cleveland Browns were only 8-point underdogs by the same rating, at the end of a season where they finished 0-16. But if there is an upside to how awful these Bills are, it’s that they helped bring historical notability to an otherwise run-of-the-mill game. Now let’s see if the Vikings can cover the spread against them. It can also come down to scheduling quirks. Some years, there just aren’t any enormous mismatches so early in the season. The Bills were one of those teams when, as 20-point home favorites over the Colts in 1991, they won 42-6.